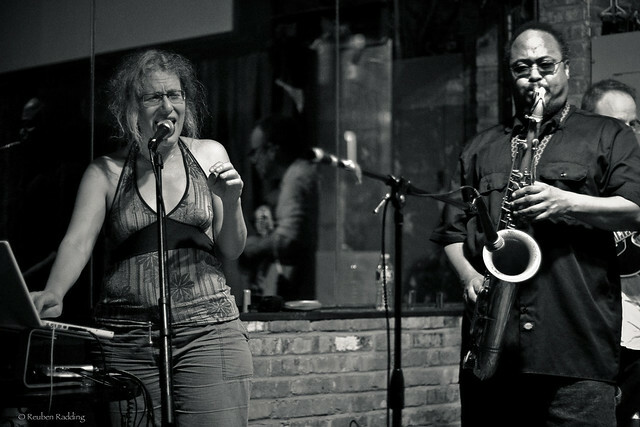 Dafna Naphtali and Ras Moshe have collaborated and performed together since 2005 in various musical configurations. Dafna’s been working, since the mid-90’s, on ways to incorporate live sound processing into improvised music with avant-jazz leanings. Fusebox is her longtime collaboration with Ras Moshe, and has included duo and trio performances that have included bassist Shayna Dulberger, trombonist Jen Baker, guitarist Michael Gregory Jackson, drummers Andrew Drury, Jeff Arnal, Jackson Krall and others. Unreleased tracks from their recordings are planned for released in 2018-2019. Links below are unreleased audio tracks, short excerpts of recordings, and video some of these many performances. Saxophonist Ras Moshe was born and bred in Brooklyn. He gained his early musical sensibilities from his family upbringing and later played in community jazz orchestras. He also spent his formative years in venues such as the East (in Bedford-Stuyvesant, Brooklyn), where so much creative music was happening in the 1970s and 1980s as a part of the broader upwelling of African American cultural expression in the area. By the late 1980s, he was playing professionally in free jazz and reggae contexts. In the past 15 years, he has emerged as a fresh saxophone voice on the scene through his formation of the Music Now Ensemble (with varying lineups) and a quartet in his own name. He also co-leads a duo with bassist Shayna Dulberger and joined Bill Cole’s Untempered Ensemble in 2009. Dafna’s musical DNA started with jazz. As a teenager, she started her music studies as a jazz guitarist, studying with Allen Hanlon, and later studies jazz voice and did many standards gigs as singer or singer/guitarist. In the 90’s she started making interactive electronic music and connecting the dots. This collaboration is a prime expression of Dafna’s long standing ideas about sound and live sound processing in improvised music, playing her unique technical setup as a flexible and musical “instrument “ in the context of this music. – including improvisations, novel arrangements/configuration, sometimes with favorite repertoire pieces, and original compositions — very connected to churning polyrhythms, and extended tonalities that encompass both the acoustic and electronics expressions of sound. Z-plane duo at WKCR — coming soon! Tagged Ras Moshe, Shayna Dulberger.